The theme for this weeks friendly art challenge is: Hearts! 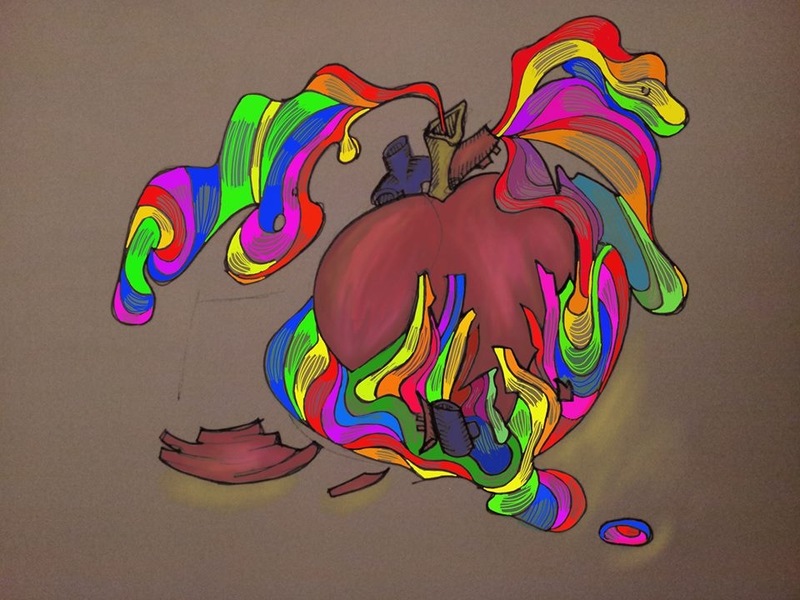 RJ’s: Love, Digital drawing- RJ wanted to create a piece that signified the surge of love bursting within a heart. I think he succeeded! When I first saw RJ’s piece I instantly thought of a germinating seed, like love sprouting in wild, it was drawn very organically. I like how the colors of the heart are dull and mature in comparison to the youthful colorful ribbons representing love. It reminds a viewer that no matter the appearance of someone, there is a complexity of emotion and feelings surging beneath the surface looking for an escape – we all have ability to love and we all need love. Great Job RJ!! 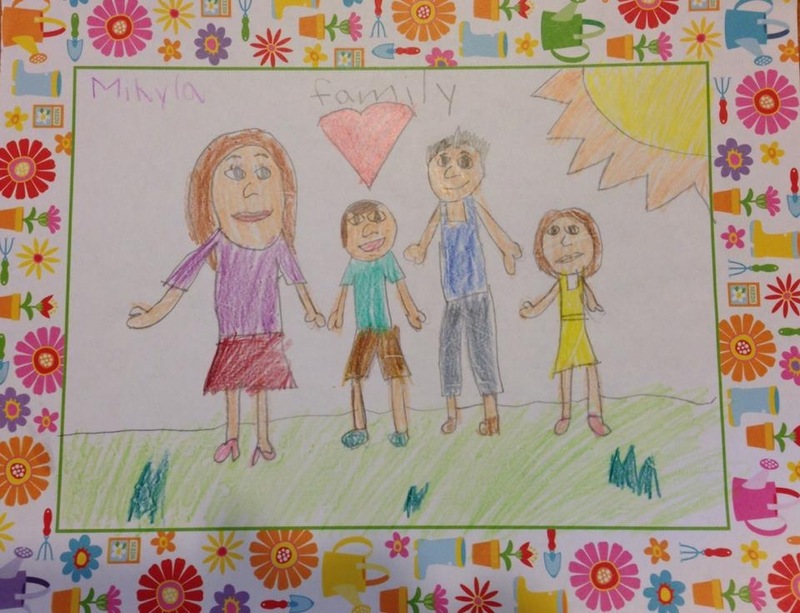 Mikyla’s: My Family, Crayon – A portrait of her family. How very sweet and a perfect interpretation of this week’s theme! You can tell how much she loves her family by how she centered them perfectly in the composition and giving them a bright sun to shine over them. 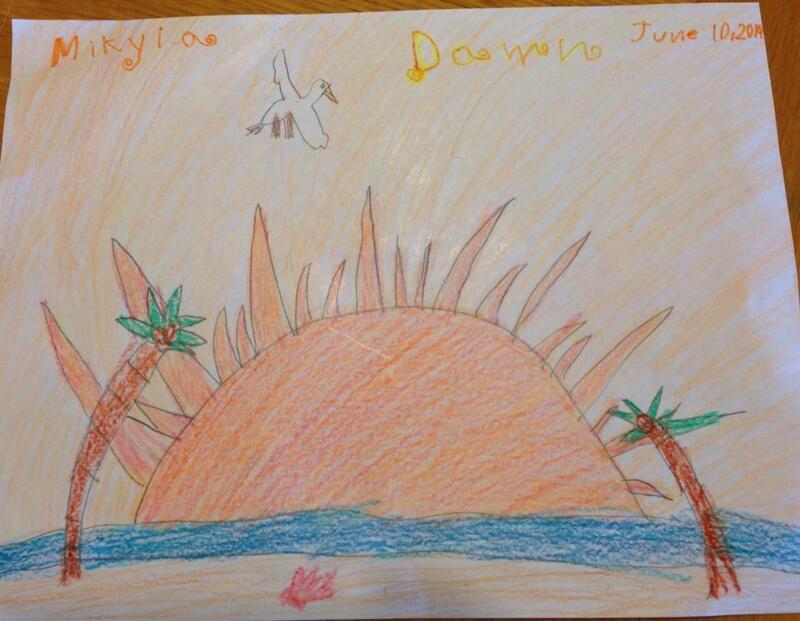 I love the border around the image, its adds an extra bit of summer fun to her drawing. 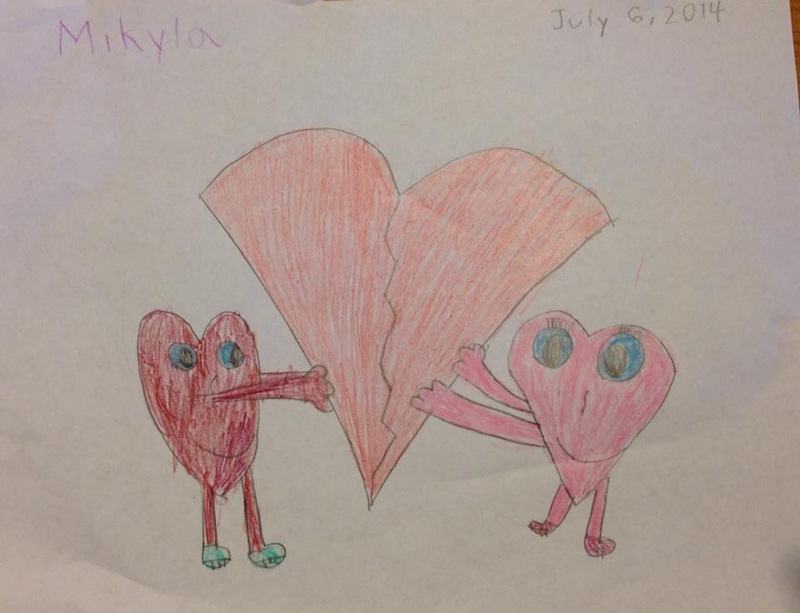 Her second drawing – the one with two smiling hearts – is also a nice and smart piece. For me it looks like love is healing a broken heart and also strengthens the importance of family in the first drawing! Great Job Mikyla!! Can’t wait to see what you make next! 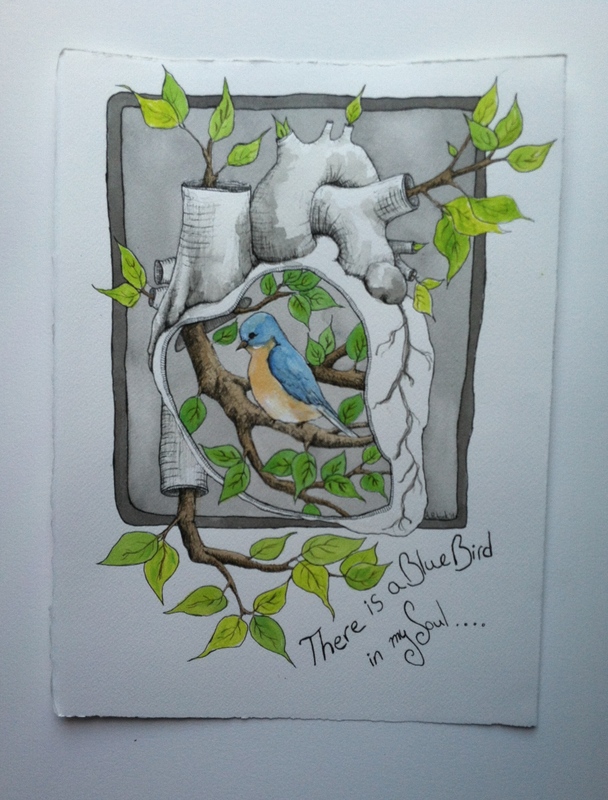 Mine: There Is A Bluebird In My Heart, And It Wants To Be Free, pen, ink and acrylic on paper – I was originally going to create a piece that had a more morbid gothic perspective on love, that was until I was driving through the Adirondacks and listening to a Vermont public radio station. A local singer, Anders Parker, was promoting his new album and the title – There is a bluebird in my heart – was in reference to a poem by Charles Bukowski. I instantly fell in-love with the title. Out the window went my original idea and the moment I was home I threw myself into my art supplies and began sketching ideas. I kept the heart in black and white to signified the cold imprisonment of the Bluebird. 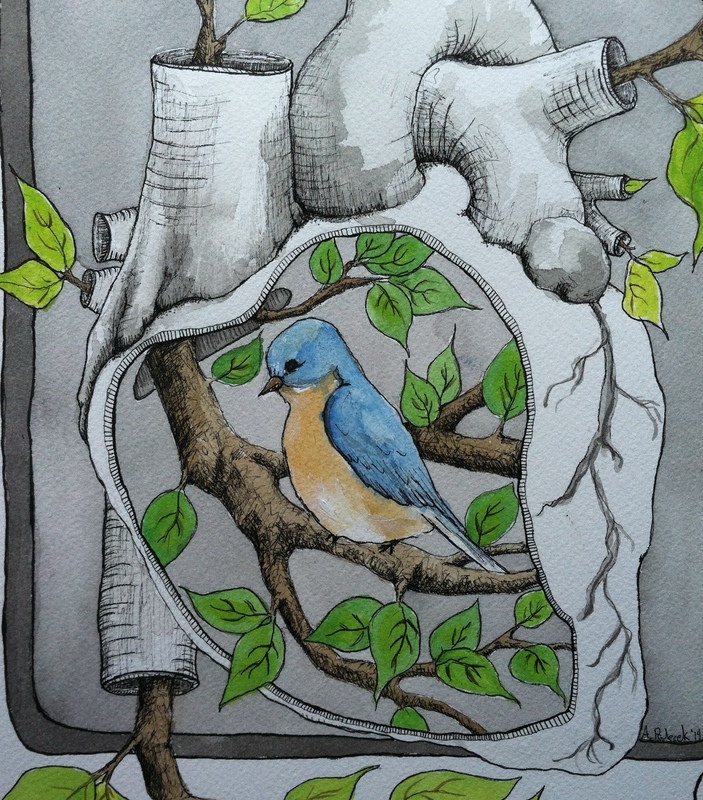 The branches growing from the arteries signify the Bluebird’s desire for freedom and the hope that the heart will soon release its grip. For the next challenge we are allowing ourselves TWO weeks to complete. We want to make something really special for the next theme: Artist Choice! The theme for this week’s friendly art challenge is TOMORROW! It was a tricky challenge, but I think we managed to come up with some creative interpretations. What do you think? RJ’s: ART ADVENTURE, digital collage – I love this piece!! Its a little funky, a little dreamy, definitely a bit retro (the imagery reminds me very much of the old school video game graphics from my childhood) and whole lot of fun! RJ had explained that he was inspired by both his past and future travels when creating his piece, and I can definitely see where and how his travels have influenced his imagery – those perfectly puffy white sheep are most definitely and partly reminiscent of, but not limited too, a few road trips that we have taken together. The colorful layering of bold patterns and textures created a quilted affect that only reinforces his visual story telling and sense of adventure. There is a part of me that can’t help but want to invoke my inner Alice, jump through the pink window and run wild through this vivid adventure! Mine: TAROT CARDS (The Fool, The Lovers and Strength), pen and ink with watercolor – When Rj gave me this week’s challenge I must admit that I was a bit stumped. I had to spend a couple of days thinking about what the heck could I create that would interestingly depict ‘Tomorrow‘. My mother offered some decent suggestions, but nothing seemed just ‘right’. Then I began to think about fortune telling and the beautiful artwork depicted on tarot cards. I have my own deck of tarot cards, given to me by my mother years ago, that I sometimes still use for fun. I picked a few of my favorites from the major arcana – The Fool, The Lovers and Strength – and worked on recreating each card to reflect my own personal metaphors while still maintaining the core meaning of each card. 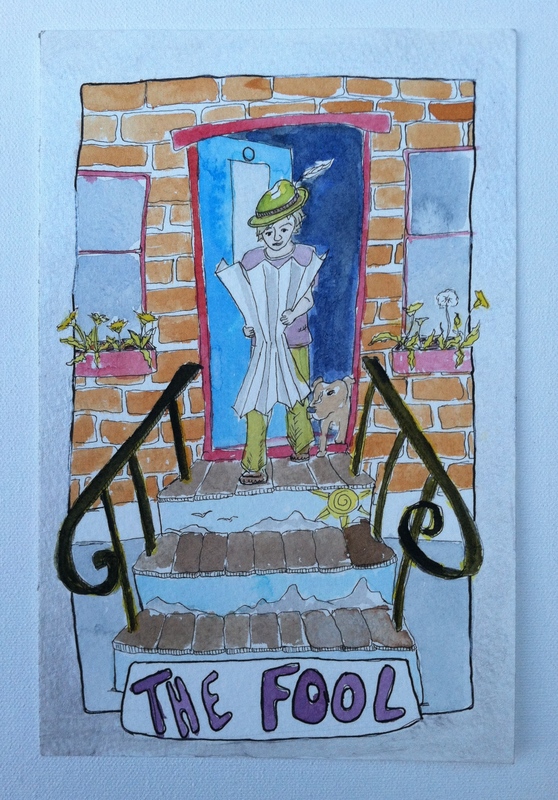 The Fool – I wanted to depict a man who hasn’t quite grown up yet and is in search of new experiences, but not fully aware of his surroundings because he is too absorbed with his own pleasure. He has a lot of learning to accomplish and the potential to take a wrong step should he avoid life’s lessons. 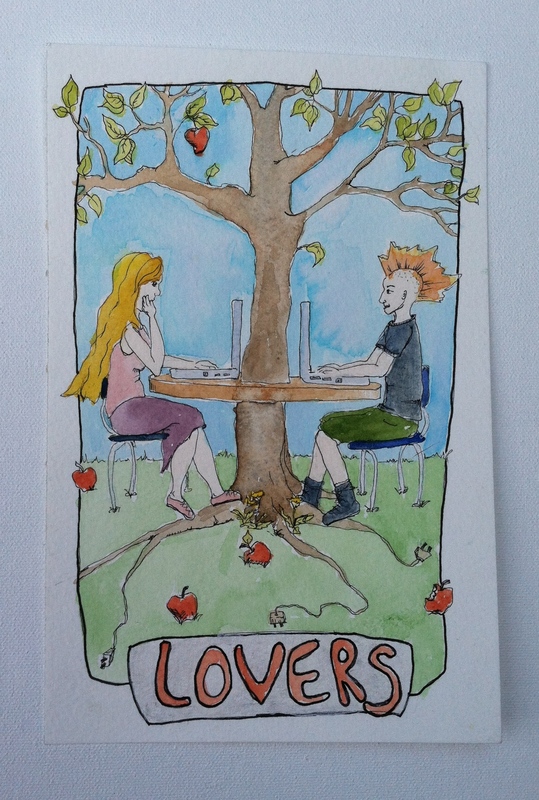 The Lovers – For this card I wanted to combine imagery that reflected both past metaphors and current trends. Though times may have changed, some things will always remain the same; the desire to connect and love another. Strength – Traditionally this card depicts a young maiden taming a lion. 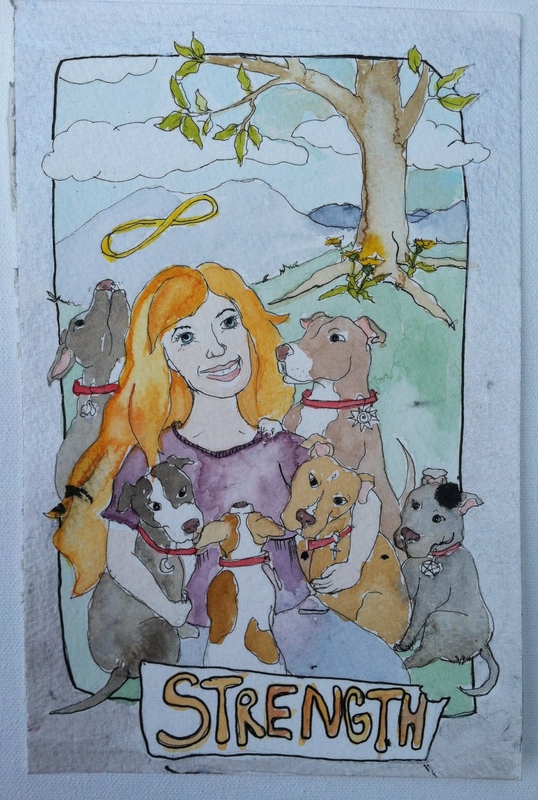 I chose to substituted the lion with a pack of lovable well behaved pit bulls. Of course I could not resist inserting my beloved dandelions into each card and I was quite upset when my pen leaked black ink onto my Strength card. Also, I wish I had drawn the people a bit better – Illustration is not my strength – but in the end I am happy with what I created and had plenty of fun working on them! It was a good challenge, RJ!